The Latin word for hedgehogs is Erinaceus and our own British hedgehog is scientifically known as Erinaceus europaeus; it is the same species that occurs throughout most of the continent of Europe. In Britain it is found almost everywhere except some of the Scottish Islands, but tends to be scarce or absent from wet areas and pine forests. Uplands and mountainsides are not popular, probably because they lack both suitable food and suitable nesting places. Hedgehogs are well established in our urban habitat and can, somewhat surprisingly, survive very well in our cities, making extremely good use of cemeteries, railway land, wasteland and both public and private gardens as long as they are joined up with others. 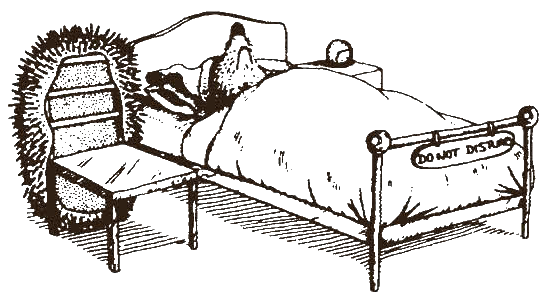 Shakespeare mentions hedgehogs in ‘The Tempest’ and ‘Midsummer Night’s Dream’ and he refers to ‘hedgepigs’ and ‘urchins’. Everyone is sure to know what a hedgehog looks like. The hedgehog’s back and sides are covered in 25 mm (1”) long spines (which are really modified hairs). These are absent from the face, chest, belly, throat and legs which are covered with a coarse, grey-brown fur. There are approximately 5,000/7,000 spines on an average adult hedgehog. What many people do not know is that a hedgehog has a small tail. Hedgehogs are certainly noisy eaters as people who have encountered these animals ‘at table’ will testify; but what do they actually eat? This diagram shows that beetles are a major food item along with caterpillars and earthworms. 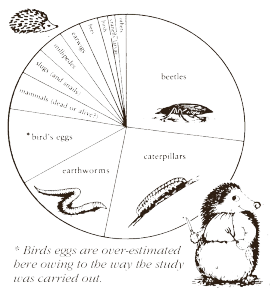 Most people are aware that hedgehogs are basically insect eaters. At the risk of disappointing some people, it is worth mentioning the fact that hedgehogs tend to ‘do the rounds’ and visit several gardens within an area. Ten or more different individuals may visit a garden over several nights, which could mean that ‘your hedgehog’ is in fact probably a number of different individuals visiting at different times. Slug Pellets are poisonous and should not be used. If absolutely necessary, pellets should be placed in a pipe or under a slate inaccessible to hedgehogs. Dead slugs must be removed daily. Use other garden pesticides sparingly;- or better still not at all, you never know what else they might kill or make sick. Always try alternative methods – see BHPS leaflet on ‘Creating a Wildlife Garden’. These can be death traps to small mammals. Always ensure that there are several gently sloping slipways around the edge of the water to enable animals to escape if they fall in. Ensure the pool cover is on every night and that the polystyrene floats are placed near the side for a hedgehog to cling to. Slipways may be made by half submerging bricks or rocks around the edges of ponds and pools. Alternatively a piece of chicken wire can be hung over the edge like a scrambling net which hedgehogs can climb up to freedom. Keep the pond level topped up so that hedgehogs can reach the wire. Do remember hoglets will need a longer ramp than an adult hedgehog. Many small animals including hedgehogs and birds cannot escape from sheer-sided pits beneath these grids. A small ramp or slope in one corner of the pit enables the trapped animals to walk out – see BHPS leaflet ‘Ramps’. Hedgehogs can become entangled in tennis and other nets, causing death by starvation. Roll up the net well above ground when not in use. Keep pea netting 22-30cm (9-12”) off the ground so hedgehogs can pass safely underneath them and plants will grow up to the netting. Legs can also be caught in the gaps between logs in rolls of log edging. When tidying the garden, take care when moving piles of leaves and other garden rubbish as these are ideal places for a hedgehog to make its nest. Hedgehogs are inquisitive and will try to eat almost anything, a trait that can lead to their undoing. Having been attracted by the remaining contents, hedgehogs have been found with their heads stuck in tins, yoghurt pots and plastic cups. Always cut the plastic rings of “4 and 6 pack” holders. To prevent such unnecessary deaths, litter should be disposed of in a proper manner. Keep bags used for putting out household rubbish off the ground. This will prevent hedgehogs reaching in them and tearing the bag. They can become trapped in the rubbish or even put out for refuse collection. Keep drains covered so that hedgehogs do not become stuck down them. Bean trenches, footings, fencing holes and car inspection pits are all potential death traps for hedgehogs. Provide an escape route, eg a sloping plank, or cover the holes so hedgehogs do not become trapped. Keep shed, greenhouse and garage doors closed at night so hedgehogs are not tempted to make a nest in them, and perhaps become trapped in them when doors are permanently closed. Store chemicals safely. When replacing or installing walls or fencing provide a 13x13cm (5×5”) hole so hedgehogs can pass from your garden into your neighbours garden without difficulty. Only use environmentally safe wood preservatives on your fences, garden furniture and wooden buildings. Do keep dogs under control if you know you have hedgehogs in the garden. Also, remember that whilst your dog may be hedgehog friendly, visitors dogs may not. If in doubt keep your dog on a lead when it goes out into the garden when its dark. If it is necessary to remove fleas from a hedgehog, then a commercially prepared powder suitable for caged birds can be lightly dusted amongst the spines (taking care to avoid the face of the animal) as an adequate treatment, but do not use on very young hedgehogs. The good news is hedgehog fleas are host specific and will not infest your cat or dog. Cat and dog treatments are far too strong to use on hedgehogs. Blood-sucking ticks are often found on hedgehogs and after taking their fill of blood, will drop off the host in order to complete their life cycle. Removal of these ticks is a difficult task but can be accomplished by using a tick remover. Though you may prefer to leave this to someone with experience as it is easy to leave the mouth-parts and head in the skin which may turn septic. Hedgehogs may give birth to their hoglets late in the year. Such youngsters will not have enough time to build up sufficient fat reserves to enable them to survive hibernation. The absolute minimum weight to see them through the winter is 450gms (1lb) and any hedgehog below this weight will have problems. However hedgehog carers prefer to get autumn juveniles in care to an optimum weight of 600gms (1lb 6oz) or more. Autumn juveniles, i.e. youngsters found alone and under 450gms (1lb) after the end of September will need extra help, even if just additional feeding in the garden. Call the BHPS for further advice on 01584 890801 and a copy of the leaflet ‘Autumn Juveniles’. If the hoglet is very young (under 160gms/6ozs) it should be given extra warmth, either a hot water bottle wrapped in towelling or blanket or placed on a heated pad (again call BHPS for extra advice). It should be placed in a box lined with plenty of clean fresh straw, torn newspaper or clean old towelling for bedding. Out buildings are fine if heated but don’t put hedgehogs directly onto a metal grid or wire floor, or straight onto concrete – they have sensitive feet and the cold will permeate through. Once eating, a suitable diet can consist of hedgehog food, meaty cat or dog food or cat biscuits. Fresh water should ALWAYS be available. NEVER COW’S MILK. For care of very young hoglets offer warmth as above and seek advice quickly. The BHPS has a leaflet, Caring for Hoglets, available from the address below or on our website www.britishhedgehogs.org.uk. However this is a specialised job and it is better to pass the hoglet(s) onto an experienced carer. Call BHPS on 01584 890801 for details of your nearest carer. Once the hedgehog has reached 600-800gms (1lb6oz-1lb13oz) release can be considered if the weather is stable and the site suitable. Choose a period of relatively warm, damp weather and ensure that plenty of dry nesting material is available for the hedgehog to build a winter nest and hibernate. If in doubt allow the up-to-weight hedgehog to hibernate in a cold outhouse in a box filled with dry fresh straw providing food until it is no longer taken. Once hibernating provide dry foods so should the hedgehog wake it will have food and water available. Release in April when food is more plentiful or when the wild hedgehogs are seen coming out of hibernation. When possible release where found, if not possible please ensure that the release site is already inhabited by hedgehogs as this is an indication that the area is ‘hedgehog friendly’. See BHPS leaflet ‘Into the Wild’. If you want to attract wildlife to your garden ensure there is easy access for them, leave wild areas and avoid ‘tidying up’ too much. Hedgehogs tend to hibernate between November and mid-March and may choose the stack of leaves or branches in your garden. For this reason if you have to get rid of such material, move it to a different spot before setting fire to it; a hedgehog may be sheltering or hibernating in it. They like to nest under things (e.g. sheds, hedges and brushwood) and need plenty of dry leaves to build their nest. 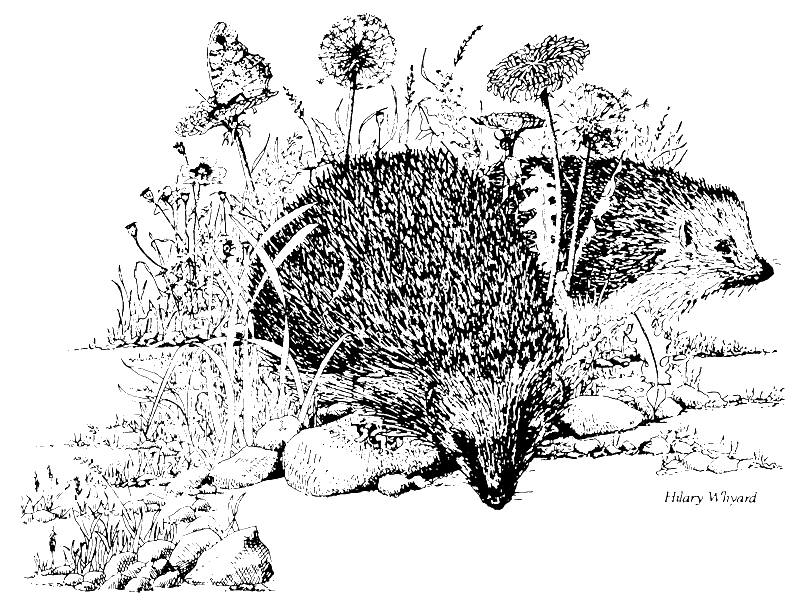 The use of information and the reproduction of illustrations from ‘Hedgehogs’ by Dr Pat Morris (Whittet Books, £14.99) is gratefully acknowledged. Dr Morris is one of the country’s leading hedgehog experts and his book gives factual, down to earth information on hedgehog behaviour, habits, physiology and private life, illustrated with delightful and amusing drawings by Guy Troughton. We also thank Hilary Whyard for the illustration on the front cover of this leaflet. Other excellent books are ‘A Prickly Affair – My Life With Hedgehogs’ by Hugh Warwick and for advanced reading on rehabilitation – ‘Hedgehog Rehabilitation’ by Kay Bullen VN. All of these books are available from the British Hedgehog Preservation Society and can be ordered by phone or found in our online shop.